This carpenter bee (Xylocopa violacea) was trying a few times to land on the flower, while I was trying to record that. Once I was successful. Later at home, in "dark room", i seen this little ants how defend their property, attacking thumb size bee. Fine behavior image- I don’t think I’ve seen an ant attacking a bee before. Interesting behavior well captured. 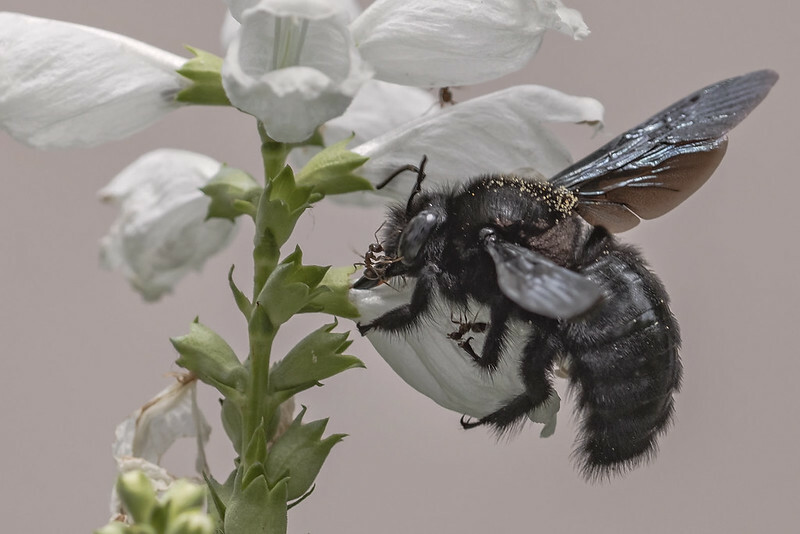 Contrast between between white flowers and the dark bee well handled. Good detail in the blacks. The ant is a nice bonus element and shows the huge difference of theirs sizes. The whites seem a bit gray to me. But that is minor. Amazing behavior shot! Brave little ants. How wonderful to have discovered this story-telling moment. Excellent capture of the interaction between the defending ants and the bee! In my last (blurred) photo of this scene which I was take, while the bee take off, one of these ants hangs from the bee's leg.